We understand that reaching out for help can be a hard decision, and we would like you to have as much information as you need to feel comfortable moving forward with choosing a sleep consultant. Below are our most frequently asked questions. How is Restful Parenting’s approach unique? We believe that a parent’s mental health is just as important as that of the child and the best way to protect the emotional well being of everyone is to deal with all of the issues at hand including: sleep, nutrition,stress, anxiety, fears and emotions. We use our vast experience with our own children (6 between the two of us) and the 15+ years each as Early Childhood Educators and Home Childcare Providers to really connect with each child’s temperament. We encourage parents to respond and attend to their child throughout the whole process. What age is your program designed for? We work with all age groups including prenatal all the way through to school age. It is never too early or too late to get started on the path to healthy sleep. My child is under 4 months old. How can you help? At this age, we are working on establishing healthy sleep and are not sleep coaching. We want to maximize the amount of sleep you and your baby are getting in the first few months after their arrival. My child is 3 years old, is this too late? It is never too late to work on sleep. We have years of experience working with toddlers and school age children giving us the ability to work not only with sleep challenges but also behavioural and emotional challenges. What if my child isn’t experiencing sleep challenges, would this still be valuable? Absolutely! Even with the best of sleepers, there are still bumps in the road. Learning how to tackle these little challenges before they become serious is invaluable! Ah, the million dollar question! This all depends on which method you choose and how consistent you are implementing it. Our goal is for you to see major improvements as quickly as possible however, our focus is on you and your child. We want to make sure that you are all adjusting well and comfortable moving through each step. The process can go as fast or as slowly as you need it to go as it is fully customized for your family. We are only a part of the equation. We will provide you with all the information needed, we will answer all of your questions and we be will with you every step of the way however, if the plan is not implemented or advice not followed, we cannot guarantee success. Communication will be essential for success. Although we are a quick email away, we are not physically able to be with you as you make this change. Therefore daily communication with detailed information will be our key to understanding exactly what is happening and how we can guide you. Is this CIO (Cry It Out)? In short, this is not cry it out. We will never ask you to leave your child to cry alone without you there to support them. We want you to respond and attend to your child and we want your child to learn that when they need you, you will be there for them. We also know that crying is your child’s way of communicating which is why looking at the full picture of the child’s 24-hour day is essential to determine what may be contributing to the upset. 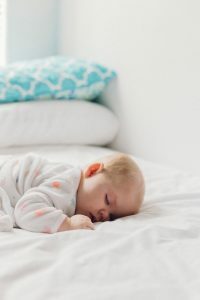 What if I’m not ready to have my child falling asleep independently, but would still like to establish healthy sleep? We realize that not everyone’s goals are to have their child fall asleep independently. However, it is always beneficial for the whole family to establish healthy sleep habits as soon as possible. Our foundations for healthy sleep will help you understand your child’s sleep and how best to help them. What if I co-sleep or bed share with my child? We work with all parenting styles. Co-sleeping, bed sharing, baby wearing, gentle-no cry approaches. Our program is designed to work for all families. What’s the difference between reading books about sleep and hiring a sleep consultant? The support! Our weeks of email and phone support is important in the overall process. We are there to guide you, encourage you and empower you with the confidence to change the way your family sleeps. Our daily communication also enables us to make any necessary tweaks to ensure you and your child are adjusting to all of the changes, and answer any questions you have along the way. You can read our testimonials from our happy and well rested clients here. Still have questions? Let us answer them with a free 15-minute consultation call.